Paperback, 7 x 9 in. / 192 pgs / 200 bw. The American architect Hugh Stubbins (1912-2006), who began his career as Walter Gropius's assistant at Harvard, saw his field as all-encompassing and his work as modest within it: "I think of architecture not as individual buildings but as the whole fabric of our physical environment. Architecture is the man-made world in its totality…It is seldom, if ever, that one can design the whole fabric." 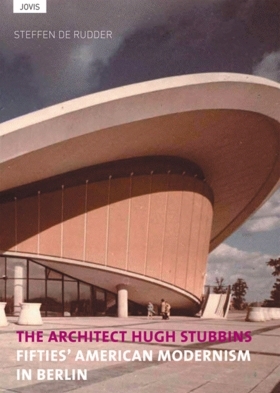 Any disappointment Stubbins felt with the human inability to oversee "the man-made world in its totality," he channeled into becoming one of the most important international architects of post-war Modernism. His soaring high-rises brought him fame worldwide. The angle-topped Citicorp building in New York remains a signature element of the city's skyline, and as late as the 1990s, (when he was in his eighties), Stubbins was working on the Landmark Tower in Yokohama--Japan's highest building. This monograph centers on another triumph, the swooping 1957 Kongresshalle in Berlin, which engaged the gears of architecture with those of history, bringing Modernism back to Germany. Fifties American Modernism in Berlin is the first detailed publication dedicated to Stubbins and his oeuvre. FORMAT: Paperback, 7 x 9 in. / 192 pgs / 200 b&w.